To open up new possibilities for wood, a renewable source, we are expanding our fields from pulping technology to nanotechnology as we pursue development of cellulose nanofiber. In April 2013, we established the CNF Research Laboratory (formerly CNF Business Promotion Office) within our Research and Development Division. 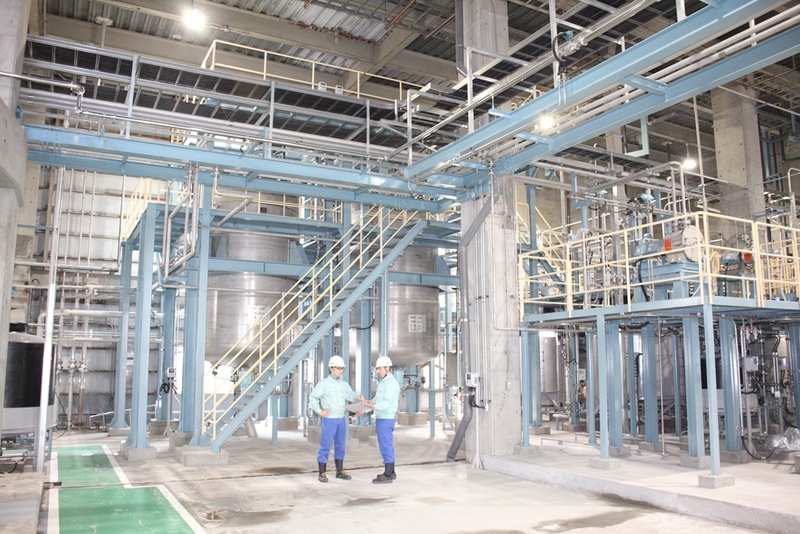 Then in October 2013, we established the first pre-commercial plant in Japan within our Iwakuni mill as full scale facility for producing cellulose nanofiber by chemical treatment, with an annual production capacity of over 30 tons. On April, 2017, we started operation of a large-scale CNF production facility at the Ishinomaki Mill. 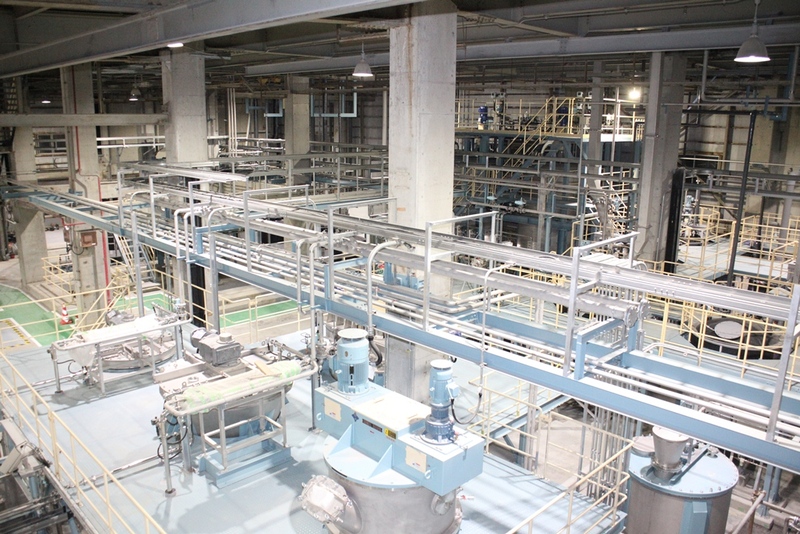 The large-scale CNF production facility at the Ishinomaki Mill is able to produce CNF that is completely nano-dispersed with uniform fiber widths of 3 to 4 nm from wood pulp that is chemically treated by TEMPO catalytic oxidation method (see Note 1). TEMPO-oxidized CNF is characterized by its transparency and has possibility of the addition of various functions. In addition, following the Ishinomaki Mill, we will launch the operation of a demonstration facility for the production of CNF-Reinforced Plastic (see Note 2) at the Fuji Mill (Fuji City, Shizuoka) in June, 2017 and the operation of a large-scale production facility of CNF that is to be put into practical use as food and cosmetics additives (see Note 3) at the Gotsu Mill (Gotsu City, Shimane) in September, 2017. As a comprehensive biomass company shaping the future with trees, Nippon Paper Industries will instantly establish the manufacturing technologies of CNF suitable for various applications and the system for commercial supply , and create the markets for new materials and CNF. Note1:Chemical denaturation of cellulose based on TEMPO catalysis. The method was developed chiefly by Professor Akira Isogai of the Department of Biomaterial Sciences, Graduate School of Agricultural and Life Sciences at The University of Tokyo. With this method, pulp is easily defibrated and nanofiber with a uniform width can be created. (Note 2) CNF-Reinforced Plastic is produced by mixing CNF into plastic, such as polypropylene (PP), polyethylene (PE), nylon and other plastic, resulting in additional strength. (Note 3) Microfibril cellulose with a fiber width of several to dozens of nanometers produced from wood pulp that is chemically modified by using the manufacturing technology of carboxymethyl cellulose (CMC) that is already sold as food additives. 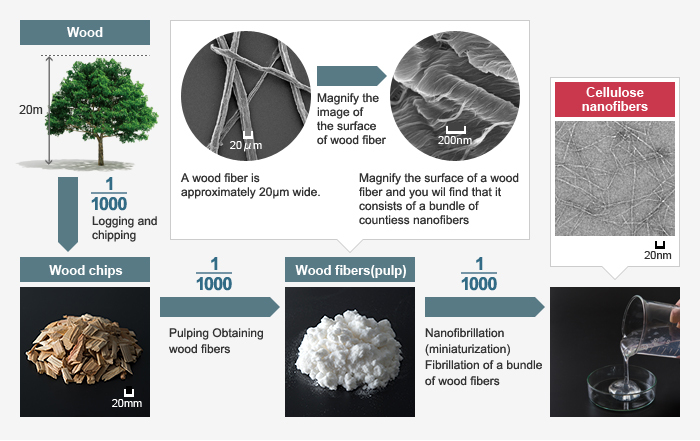 Made from wood-derived fiber (pulp) that has been defibrated to the nano level of several hundredths of a micron and smaller, cellulose nanofiber is the world's most advanced biomass material. As the material is derived from plant fibers, it creates low environmental impact in its production and disposal. Among its outstanding characteristics, it is lightweight, has an elastic modulus as high as that of high-strength aramid fiber, exhibits thermal expansion on par with glass, and presents high barrier properties with regard to oxygen and other gases. Trees are composed of wood fibers, which in turn are made of cellulose nanofibers, aggregations of cellulose molecules. 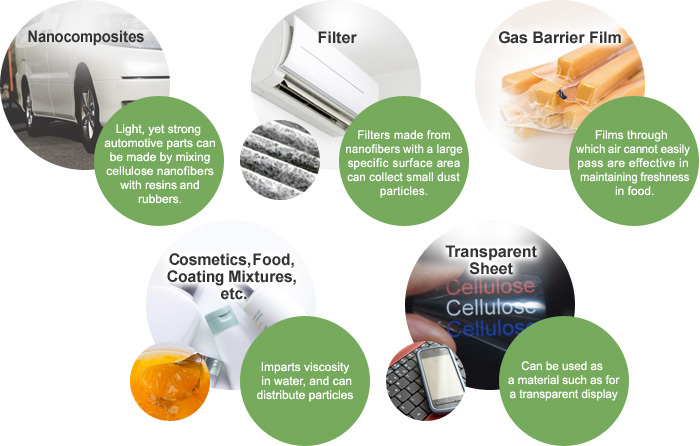 Due to its morphology and characteristic physical properties, cellulose nanofiber is seen as a promising material for use in a wealth of fields, including filter material, high gas barrier packaging material, electronic devices, foods, medicine, cosmetics, and health care. We succeeded in the commercialization of highly effective antibacterial and deodorant sheets using CNF with TEMPO catalytic oxidation method. Nippon Paper Crecia Co., Ltd. (President: Yasunori Nanri), a Group company started selling the "Hada Care Acty" series as adult diapers as a world's first product made from functional CNF Sheets. Moreover, Crecia is now selling "Poise" series as mild incontinence pad made of same type of CNF sheets. Products of Nippon Paper Crecia Co., Ltd. using a sheet with antibacterial and deodorizing effects that is produced by putting TEMPO-oxidized CNF into practical use.